It’s a Sign! 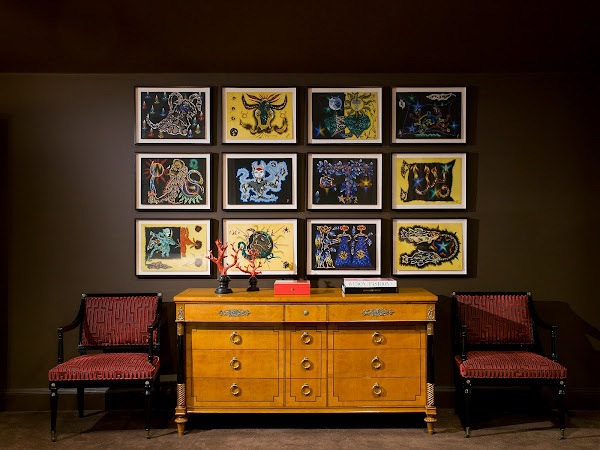 A suite of French zodiac prints from the 1940s were the inspiration for the master bedroom’s design, says Dallas interior designer James McInroe, who pulled colors from the artwork for the upholstery. A Charles X style chest of drawers and pair of Louis XVI chairs upholstered in JP & J Baker Fretwork velvet fabric, are from the 1960s. Edgy Classicism . . . When a young Midland couple with a toddler decided to relocate to Fort Worth two years ago for the husband’s oil and gas business, they wanted a house to accommodate their growing family. They settled on a 40-year-old, two-story red brick one with white columns in the city’s lush Westover Hills area. “We loved the neighborhood, and it had everything we wanted -- a swimming pool, big kitchen, four bedrooms, a nice sized playroom, and it wouldn’t take much work to get it looking the way we wanted it,” says the wife. There was only one problem. The homeowners, both in their early 30s, have much more contemporary tastes than their Georgian-inspired abode would have suggested. 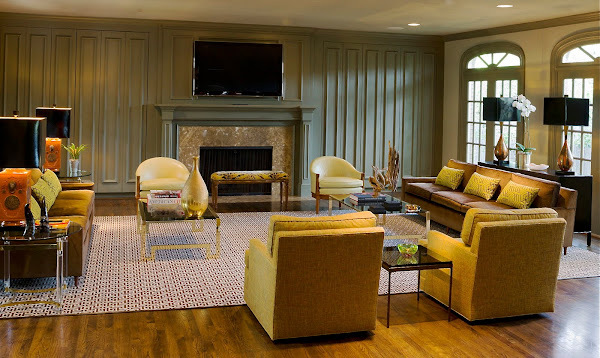 To give it a modern edge, they sought the help of Dallas interior designer James McInroe, whose team included his V.P. of operations Marcia Curtis-Hornsby, design associate Katie Whitis, and Fort Worth building contractor Matthew Adams. Seating Chart: McInroe’s judicious use of pairs provide balance and architecture in the great room’s wide open space. A black and white Greek key print rug from Stark Carpet helps define the seating area, and a pair of 70s Greek key motif brass and bronze mirror coffee tables are from McInroe’s inventory. The sofas and chairs belonged to the homeowners. 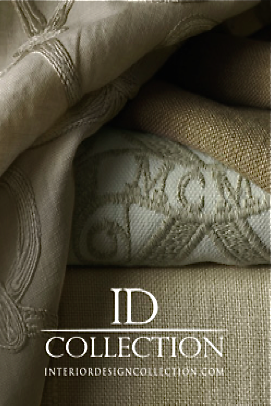 The chairs were recovered in Fabricut’s Meridian. 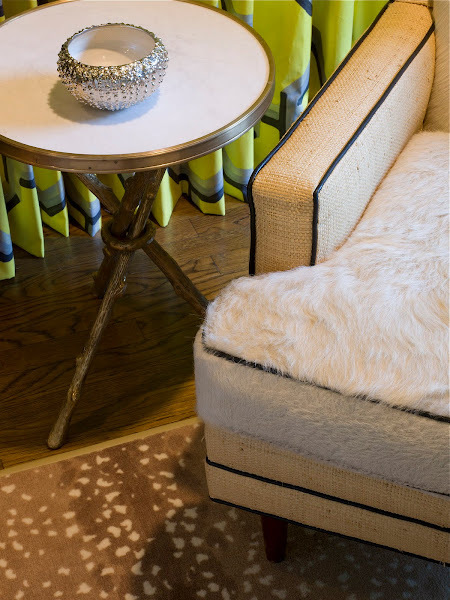 The celery color pillows on the sofas are custom made in David Hicks by Ashley Hicks. 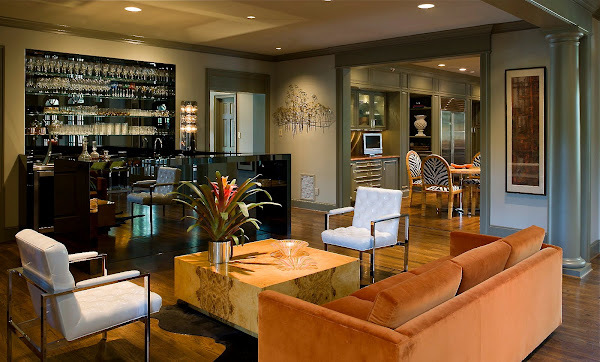 The homeowners had previously purchased furniture from McInroe’s showroom for their residence in West Texas and were fans of McInroe’s edgy color schemes and sleek mid-century modern look. “I really wanted the house to feel like James’ style. Basically, we let him do a complete turnkey job,” says the wife, who was expecting the couple’s second child at the time and commuting to design meetings from Midland. Disco Beat: At one end of the great room, a custom bar made of stainless steel and bronzed mirror, anchors a lounge area furnished with 70s and 80s era pieces, including a pair of chrome Milo Baughman chairs upholstered in white Pollack patent vinyl, and a 70s Curtis Jere metal sculpture on the wall. The challenge was to make the house’s traditional styling feel more contemporary while retaining its overall classic feel. Outside, McInroe painted the columns and brick a sophisticated shade of taupe. A larger, regency-inspired front door with glass panes and steel mullions was installed for a dash of glamour. “The entry really sets the tone of the house now,” says the homeowner. A few other minor reconstructive changes were made -- the bathrooms were updated and a smoked glass bar was added in the great room, but “most of the transformation came from just paint and furniture,” says the homeowner. Kitchen Confident: McInroe gave the homeowners the look of a new kitchen with minimal renovations. 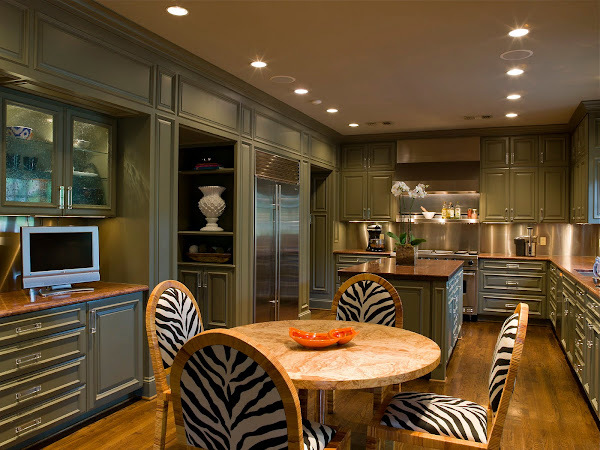 The wood stained cabinets were lacquered gray and granite backsplashes were removed in favor of stainless steel. A custom tabletop in olive ash burl was made for the vintage stainless base; the homeowner’s rattan chairs were recovered in a zebra fabric by Sunbrella. Known for his use of saturated statement making colors, McInroe’s decision to use varying shades of gray on the walls, paneling, woodwork and mantles throughout the house might seem uncharacteristically reserved. “I wanted something neutral to dignify the bones of the architecture,” he says. Color pops instead from furniture and accessories in oranges, golds, browns, blacks, whites, and the occasional chartreuse pillow. Juxtapositions of textures and materials shake things up: sleek white patent leather chairs next to a polished burl wood table; a pair of richly figured cactus wood benches sitting atop a David Hicks-inspired geometric rug by Stark; a rough driftwood sculpture contrasting with a shiny chrome table and polished brass lamps. 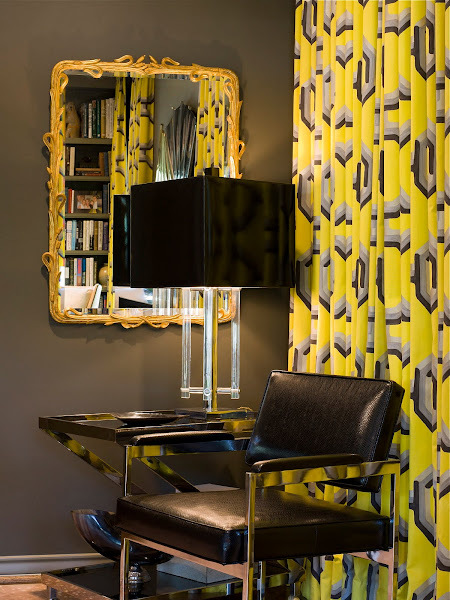 Pure Geometry: In the study, bold yellow and gray hex print Designers Guild draperies from Osborne & Little, pay homage to one of McInroe’s favorite designers from the 60s and 70s, David Hicks. A vintage early 80s two-toned metal sculpture by Curtis Jere carries out the geometric theme. A 50s walnut and leather bench and custom chair in white hair-on-hide from Edelman Leather and Phillip Jeffries raffia, are from McInroe’s stock. The family spends most of their time in the great room and kitchen, which are connected by large openings. 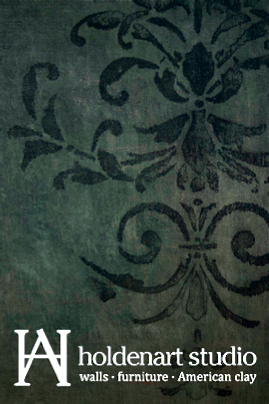 Glamour Shot: Swathed in elegant brown silk draperies and wall paint, the dining room encourages intimate conversation. A 60s neoclassic style table from Baker, Macassar ebony buffet from Ralph Lauren, and vintage crystal chandelier, were in the homeowners’ previous residence. “The great room really sold us on the house,” says the wife. “We love to entertain, and I wanted the room to be fun. James designed the bar and game area on a cocktail napkin one afternoon.” With a flat screen over the mantle, the room functions for the kids beautifully as well. Because of the room’s large size, McInroe created a framework of seating areas that are formally balanced with pairs of sofas, chairs, and tables. “It’s such a large space that without structure you’d get lost in the room,” he explains. 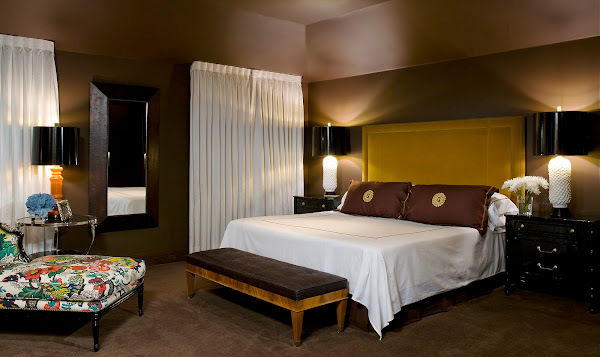 Drama and Dreams: Uneven ceiling and walls in the master bedroom are minimized with rich brown paint. A custom headboard is covered in Donghia gold velvet; the 1950s American bench is covered in Phillip Jeffries black African raffia; the chaise is covered in a floral Schumacher fabric that pops against the dark walls; the pair of side tables and lamps are vintage pieces from McInroe’s stock. With kitchen in full view of the main living areas, it needed to tie in seamlessly. “We wanted it to look more dignified and less kitchen-y,” says McInroe, who painted the cabinets gray and replaced the granite backsplashes with stainless steel. A breakfast table was made from a 70s steel base and a custom olive ash burl wood top. The homeowners’ rattan chairs were covered in an outdoor zebra fabric for dash. Jump for Joy! Pops of neon green keep the black and white color palette of the guest bedroom from being too serious. 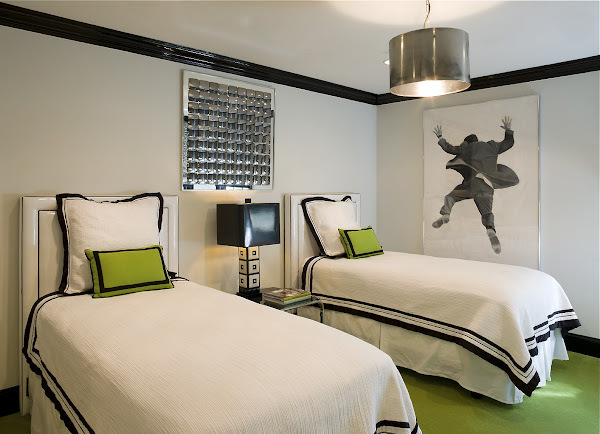 Custom headboards in white vinyl patent leather from Pollack; green Sunbrella pillows; 1950s black and white lamp and convex Op Art mirror are from McInroe’s stock; carpet is from Stark; metal hanging pendant is homeowner’s; artwork was done by the homeowner while in college. The whole renovation project only took four months, start to finish. “We came in on budget and under deadline,” says the wife. “I tend to be much more in control, but I was happy to get out of my box on this one.” The husband, who had not seen the house since the day they bought it, came in after everything was put together for a dramatic unveiling. “He loved it,” she says. 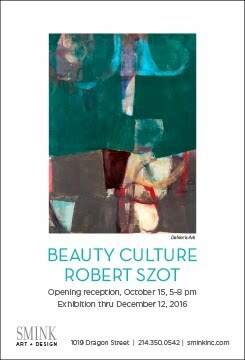 A version of my story also appears in Luxe magazine.